A new statue commemorating the role of Indian soldiers in World War One was unveiled in France today to mark Armistice Day when the war ended in 1918. The seven-foot bronze statue in the town of Laventie commemorates over 4,700 soldiers and labourers from British India who lost their lives on the Western Front during World War I and have no known graves. The site in Laventie was chosen after the remains of two soldiers were identified as belonging to the 39th Royal Garhwal Rifles and reburied with military honours last year. 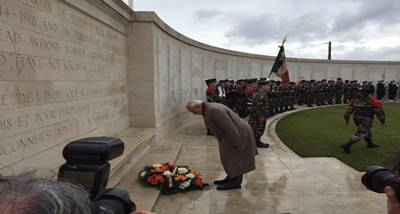 Col (retd) Deepak Dahiya, who served for 23 years in the Indian Army and is now based in Paris, said this marks the commencement of a project to establish 57 such statues near all cemeteries where Indian soldiers lie buried in France.